Good afternoon, everyone. Please ensure that your tray tables are secure and your seats are in the upright position. As we taxi into the fall, Flight YMX is delighted to welcome on board artist and curator Cheryl Sim as our collaborator. Using our two Solari boards as a starting place, Sim will be exploring ideas of memory, diaspora, hope, displacement, and migration through the lens of Mirabel airport. Drawing on video archives, oral history, crowd control stanchions, immigration statistics, and histories of resistance, Sim will create a site-specific installation that will speak to the experience of being in between arrival and departure physically, emotionally, and psychologically. We look forward to working with her to develop and find a berth for this project in a Montreal gallery when we begin our descent into winter. Bienvenue à bord, Cheryl Sim! 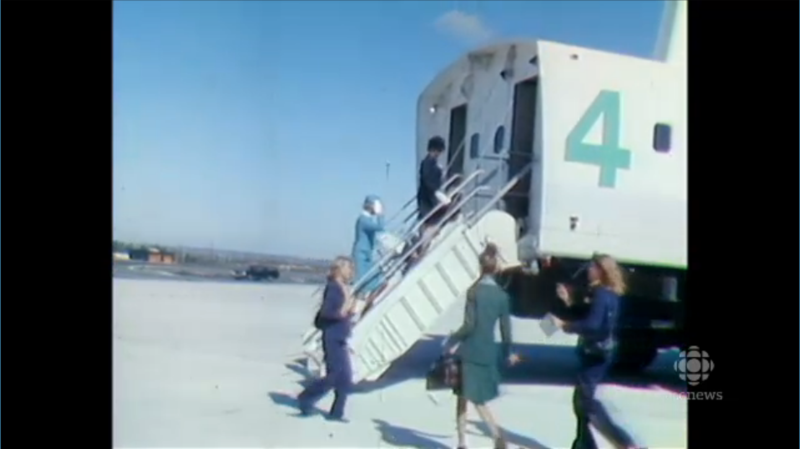 Photo: Still, CBC News, Archives: Mirabel airport inauguration, 2 May 2014, “Montreal’s ill-fated airport of the future opens its runways in 1975,” http://www.cbc.ca/player/play/2453941780. The beginning of fall feels slighly like heading off on a trip, no? As the leaves start to change colour and the air gets crisper, the days feel like hope. We may have some jangly nerves from being on a plane for the first time, or gleefully setting off at a new school: there’s a bit of anticipation, a few bated breaths, the promise of adventure. We’re excited to start the season off right with some press from Sarah Laskow over at Atlas Obscura. Her piece, “Artists are Salvaging Train Stations’ Analog Departure Boards,” talks about our project along with others who are repurposing Solari boards once they become decommissioned and removed from airports and train stations. Read about some of their split-flap afterlives here.